In a bowl add lamb chops sprinkle evenly with, pepper, garlic, mint, rosemary (or all dry ingredients). Turn over and repeat. Make sure to coat all the chops evenly with the dry ingredients on both sides. Next mix the olive oil, soy sauce, mustard and lemon juice (or all wet ingredients) in a small bowl and whisk to ensure they are mixed well and pour over lamb. mix with your hands to ensure the mixture evenly covers all pieces. You can even massage the lamb a bit ;) to get it ready! Let the lamb stand at room temperature for 45 minutes - 1 hour. Light BBQ and allow it to warm to 350. Scrape/clean grill to remove any charred spots. Reduce to Medium/high heat and add the lamb chops. Cook covered, turning occasionally. When the chops are lightly charred and tender, (160 F if you have a probe) or after about 10 minutes. 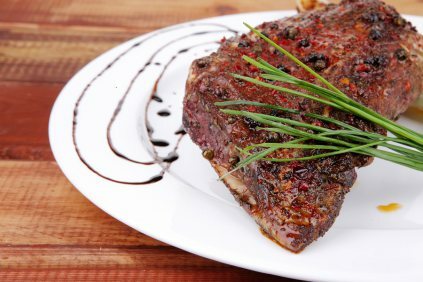 Remove from BBQ, transfer lamb chops onto a platter tented with foil and let stand for 3-6 minutes before serving. Turn on oven on bake and pre-heat to 375. Add lamb chops to baking pan, spread out in one layer, and cover. Bake covered at 375F for ~35 minutes remove cover turn meat over and bake for another ~35 minutes on the other side or until golden brown. Remove from oven and spoon lamb into platter, and pour all remaining juice over top. Light a gas grill. Wrap the wood chips in heavy-duty foil and pierce the packet all over with a fork. Add the packet to the grill. Cover and let the chips begin to smoke, about 5 minutes.